At Air Quality Systems, we provide air duct cleaning services to homes and businesses throughout Norcross and the surrounding areas. Here, we provide answers to some of your frequently asked questions about our services. If you don’t find an answer to your question, please don’t hesitate to contact us. Why Does My System Need Cleaning? Dust is made up of dirt, pollen fibers, mold spores, hair, and other allergy-causing particles, all of which get drawn into your HVAC system. About 95% of these particles will pass through your filter and back into the room or they will accumulate on the fan blades of the blower motor, the grills, or the inside of your ductwork. The buildup of dust not only reduces air flow it also can cause allergic reactions for allergy sufferers and leave your house with a musty odor. How Do I Know My System Needs to Be Cleaned? Does anyone in your family suffer from headaches, nasal congestion, or sinus problems in the morning or at night? Is there a smoker in the house or has a smoker ever lived in your home? Do you have dogs, cats, or other pets, or have pet owners ever lived in your home? Does your furniture get dusty again shortly after it has been cleaned? If you answered YES to any of the above questions, then it may be time to consider having your air duct system professionally cleaned! Air ducts are the lungs of a building, and over time, dirt, dust, debris, tobacco smoke, animal hair/dander, and other contaminants can accumulate inside the ductwork. 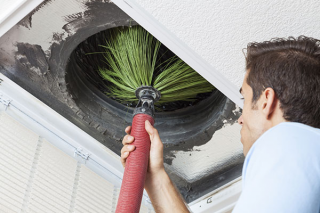 Dirty ducts can also become an ideal breeding ground for pollen, mold spores, mildew, bacteria, and other potentially harmful bio-pollutants, which can pass easily through the furnace filter and into the air you and your family or coworkers breathe. When Should Duct Work Be Cleaned? Whenever dust appears on walls, floors, ceiling fixtures, carpets, or drapes or around registers. In most homes and businesses, the ductwork should be cleaned every 3-5 years. 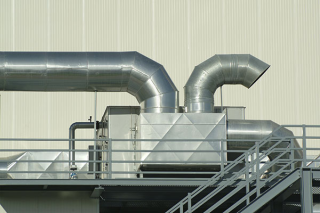 Air Quality Systems uses equipment especially designed for cleaning ductwork. We locate gasoline-powered vacuum equipment close to your system to maximize air pressure. Once the vacuum is attached to your system, debris in the ductwork is loosened and removed by a combination of reverse air and rotating nozzles, brushes, and whips with 180 lbs. of applied air pressure. The vacuum then pulls the loosened debris, dust, and mold into a specially sealed compartment at 6000 cubic ft. per minute. Heating and cooling coils are then thoroughly cleansed, as necessary, with detergents, and washed by hand per NADCA standards. The HVAC fan housing and blower units are cleansed with a vacuum and compressed air, then pressure washed as necessary. Finally, all supply and return registers are cleaned. Many of our customers (even those without allergies) report that they no longer wake up with stuffy heads. Allergy sufferers may find relief from sneezing, runny nose, and watery, itchy eyes. The dust level in the house is reduced, musty odors are gone, and air flow is increased up to 40%. Heating and cooling costs could be reduced. And most importantly, your family will breathe cleaner air! Should I Clean Just the Ductwork? Actually, the entire HVAC system should be cleaned. By cleaning all components of the system, you can reduce the risk of recontamination. Air Quality Systems follows standards set by the NADCA (National Air Duct Cleaners Association) to ensure the complete system is cleaned. What Is a "Complete System"? Contact us at Air Quality Systems to schedule an appointment!